The squadron "La Fayette" was born in 1916 to welcome the American volunteer pilots, eager to lend their support to France during the conflict of the First World War. It is thus named in honor of the Marquis de La Fayette, French hero of the United States Independence. At the end of the conflict the squadron was retired, with a total of 199 confirmed victories. From 1939 to 1945, the squadron was reformed within the Fighter Group GC 2/5 "La Fayette"
And finally in 1947, the Fighter Squadron EC2 / 4 "La Fayette" reformed in French Air Force, flying with P-47D, Vampire, F-84F, Mirage IIIE then on Mirage 2000N since 1989 on the air base BA116 of Luxeuil until 2011, then on the air base BA125 of Istres. She will converted on Rafale soon. In 2011 when the EC3 / 4 "Limousin" was retired, The "RAMEX DELTA" continue the shows with the squadron EC2/4 "La Fayette" until July 2016. 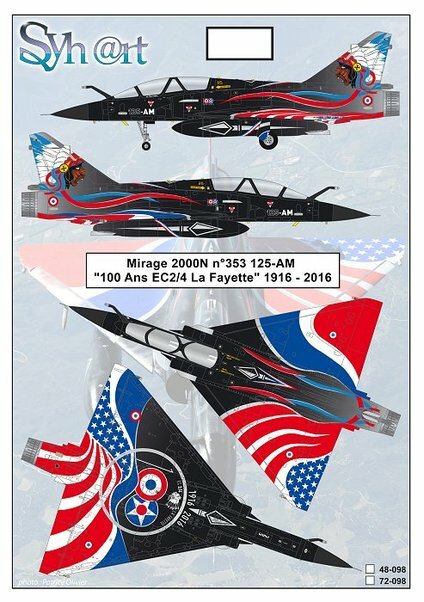 It is indeed in 2016, when the EC 2/4 "La Fayette" celebrates Centenary and its next conversion on Rafale, that the famous team "Ramex Delta" completes its last season. Steering wheel particularly on the Mirage 2000N n°353 specially painted for the 100th anniversary of the "La Fayette".